Typically people are cautioned about matching the water temperature when taking new fish home. Truth be told, temperature differences are often not as dangerous to the fish as a significantly different pH. The mysterious death of a newly purchased fish is many times due to a pH problem. Although some shops provide pH information, many do not unless requested. Before making your purchase, ask for the pH reading on the water from the tank your fish has been living in. Good shops can and will quote that information. Make sure you also know the pH of the water in your tank at home. Odds are the two values are close, but it's always better to be safe than sorry. If the pH at home is significantly different than the water at the shop, you have an important decision to make. Either you should not get the fish, or you need to alter your water so that it's reasonably close to the water the fish comes from. How Much Difference Is Significant? 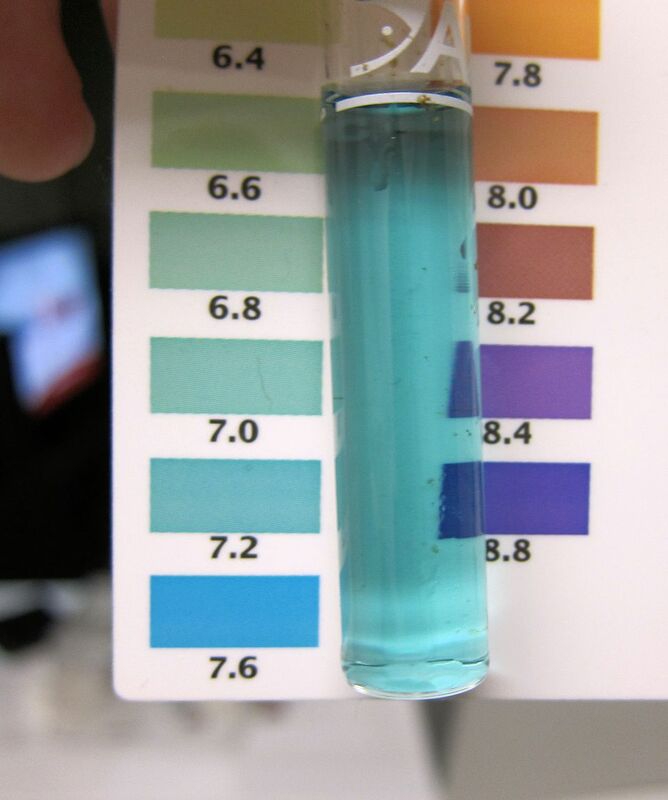 If the difference between your water and the store water is less than five tenths, you need not be concerned with altering the pH of your tank. However, some fish breeds are sensitive to even small pH changes, so do your homework before making your purchase. Neon Tetras are one fish particularly sensitive to pH changes. Take care when acclimating them to a new tank and watch closely for signs of stress. When the pH difference between the store water and your home water is between five tenths and a whole number, you need to give the matter some thought. Some fish will do just fine, while others will react negatively to such a pH change. Research the needs of the fish you plan to purchase, then consider what the pH of your water source for your home aquarium, and consult with an expert to determine the best course of action. I will be happy to answer questions about specific situations, and any reputable pet shop will do likewise. If the difference between your water and the store water is more than a whole point (i.e. : your water is 6.8 and the store is 8.0), I strongly advise against purchasing fish until you've adjusted the pH of your water. The shock of such a significant pH change could cause illness or even the death of your fish. The million-dollar question is - should you alter the pH of your water? A general rule of thumb is whenever possible leave well enough alone, as it's not easy to change the pH and keep it that way. It is more important to have a stable pH than one that perfectly matches the textbook requirements for your fish. However, there are cases when your water does need to be treated to alter the pH. Always proceed cautiously when altering pH. It's not advised to use commercial pH up or down preparations to alter pH on an ongoing basis. They are not designed to make a long-term change. Instead, look at methods that do not require frequent adding of chemicals to maintain the desired pH. When altering pH in saltwater environments, other factors, such as buffering capacity should also be considered. Due to the complexity of altering pH, we won't go into more detailed about methods for altering pH. Lowering pH: Lowering pH is not as easy as raising it. Filtering over peat moss is the method of choice. It is continuous and relatively easy to do. The use of bogwood to decorate the aquarium has a similar effect, although it's not as easy to maintain as using peat moss in the filter. Another method to lower pH is to mix distilled or RO (reverse osmosis) water with your tap water to reduce both the hardness and pH. This is effective for smaller pH changes, and you must keep in mind that every time you perform a water change or top off the tank you'll have to mix water. In other words, if you need to greatly lower the pH of your water, think twice – it is going to be an uphill battle. The addition of CO2 will lower the pH of your water. If you have live plants, the use of CO2 is an excellent option. There are several means of adding CO2, from high-end commercial equipment to simple do-it-yourself systems. Raising pH: It's not often that the pH must be increased, as most water sources are already slightly to moderately alkaline. In the event your water is acidic, you want to keep fish that originate from alkaline water (as is the case for certain Cichlids). Filtering the water over crushed coral is the method of choice for raising the pH. The use of limestone rocks in decorating the tank will also raise the pH, but keep in mind that you will not be able to adjust it readily. The addition of bicarbonate of soda (baking soda) will also raise the pH and has the added benefit of buffering the water. Keep in mind that this will be an ongoing thing, so you can't add it once and forget about it. Can Salt Cure Sick Fish in Freshwater Aquariums?